Bolivia is the world's 28th largest country (twice the size of Spain), with an area of nearly 1.1 million square kilometres. A landlocked country, Bolivia shares borders with Brazil to the north and east, Paraguay to the southeast, Argentina to the south, Chile to the southwest, and Peru to the northwest. Bolivia’s border with Peru runs through Lake Titicaca which lies in one of Bolivia’s three principal geographic regions. These regions include the altiplano (high plateau) in the west, the tropical lowlands in the east and the semitropical, temperate regions of the Yungas and the central valleys. The altiplano which covers an area of over 104,000 kilometres squared is enclosed by two parallel ranges of the Andes mountains. Lake Titicaca, the most notable feature of the altiplano, is the highest navigable body of water in the world. As such Bolivia is one of the only landlocked countries in the world to have a navy. Lake Titicaca also supports local fishing industries which fish local species such as karachi and ispi as well as farmed trout. The northeastern flank of the Cordillera Oriental is known as the Yungas, from the Aymara word meaning 'warm valleys'. This descent into the tropical lowlands is associated with warmer temperatures and increased rainfall compared to the altiplano. These climatic conditions provide some of the most fertile land within Bolivia. However its agricultural development has been restricted due to limited transport links and in some places, very steep hillsides. Many of Bolivia’s 20,000 species of plants can be found in this Yungas region. The inter-Andean valleys, situated around the cities of Cochabamba, Sucre and Tarija, are traditionally known as the country's main bread-basket. The fertile eastern lowlands include all of Bolivia north and east of the Andes, forming part of the Amazon rainforest, plus the Chaco grasslands to the southeast. Although the eastern lowland region makes up two-thirds of the national territory, it is sparsely populated. However, its economic importance has grown rapidly since the 1960s, based mainly on agribusiness and the exploitation of hydrocarbons (oil and gas). Its growing economic importance is centred on the city of Santa Cruz. Bolivia's most important gas deposits are in lowland Tarija in the south. Bolivia lays claim to the seaboard it once enjoyed until this was taken in the War of the Pacific (1879-84) by Chile. This claim remains a potent source of national frustration. Bolivia has tried to negotiate an access to the sea through northern Chile, but such negotiations have never prospered. Formal diplomatic relations with Chile are currently severed. Notable features include the ancient Puerta del Sol, or Gate of the Sun, at the pre-Columbian religious site of Tiwanaku near the major city of La Paz. The Cerro Rico mountain near the city of Potosí was the source of more than half the plundered Spanish silver that left the Americas in the 16th and 17th centuries. It is said that the silver extracted from the hill during colonial times would have been sufficient to build a bridge from Bolivia to Spain itself. The strong tradition of mining in Bolivia later led it to be the world’s biggest producer of tin for a brief period in the early twentieth century. This resulted in the creation of a powerful trade union movement. Today natural gas and soya are Bolivia's major export products. Bolivia is also the world's third largest producer of coca leaf. Although one of the poorest countries of Latin America, it is also one of its most vibrant and fascinating. In recent times, particularly since the 1990s, Bolivia has experienced major waves of grassroots mobilisation and political organising. This has been centred on previously marginalised groups such as peasant farmers, coca growers, indigenous peoples and marginal urban communities. Mobilisations have included the so-called 'Water War' of 2000, when a major multinational was forced to reverse plans for privatisation of a city water supply. Another result of mass mobilisations has been the election of the country’s first indigenous president, Evo Morales, in 2006 at the head of a coalition made up of social movements and trades union groups. Last measured at 8.3 million (2001 census). 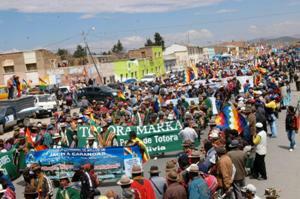 Bolivia’s national statistical institute estimates a population of 10.2 million for 2009. According to the 2001 census 62% of the population over 15 years of age self identified as indigenous. As well as Spanish, Bolivia's official languages are: Aymara, Araona, Baure, Bésiro, Canichana, Cavineño, Cayubaba, Chácobo, Chimán, Ese Ejja, Guaraní, Guarasuawe, Guarayu, Itonama, Leco, Machajuyai-Kallawaya, Machineri, Maropa, Mojeño-trinitario, Mojeño-Ignaciano, Moré, Mosetén, Movima, Pacawara, Puquina, Quechua, Sirionó, Tacana, Tapiete, Toromona, Uruchipaya, Weenhayek, Yaminawa, Yuki, Yuracaré and Zamuco. La Paz (seat of government), Sucre (judicial capital). According to the constitution, Sucre is the capital city, however La Paz is often, referred to as 'the capital'.